Kix is taking part in a Golf Tournament and much more in 2005. The Golf tournament is to raise money for Lousiana Tech where Kix went to college and the Methodist Children’s Home in Ruston. Alumni , coaches and past players and stars participate…this year it’s on Fri. March 18th. Anyone wanting to put together a team and participate is welcome– entry fees and details can be obtained at Squire Creek Golf Club in Choudrant, La. Kix is also the recipient of the first Distinguished Alumni Award from St. Andrew’s Sewanee School. “It will be given yearly to the alumnus or alumna who has achieved excellence in his or her field of endeavor and/or has made outstanding contributions to his or her community, and has brought distinction to them, to their profession and to their alma mater.” The award will be handed out during Alumni Weekend June 3-4, 2005. Kix is also being honored as a “Louisiana Legend” at the Fifteenth Annual Louisiana Legends Awards Gala and Auction on April 28 in Baton Rouge. For fourteen years, the statewide LPB television network has honored those natives of Louisiana who have distinguished themselves in their chosen fields and have made Louisiana proud. Congratulations Brooks & Dunn! The Duo has been nominated for a Grammy for Best Country Performance By A Duo Or Group With Vocal for their hit song You Can't Take The Honky Tonk Out Of The Girl. The 47th Annual GRAMMY® Awards will be presented in Los Angeles at STAPLES Center on February 13, 2005. The show will be broadcast on the CBS Television Network from 8 - 11:30 p.m. (live in the East, tape delayed in the West) marking the 32nd consecutive year the show will air on CBS. CMA Duo of the Year! Congratulations to Brooks and Dunn on their CMA Duo of the Year award! And their outstanding performance of "It's Getting Better All the Time". Nashville: When Ronnie Dunn and Kix Brooks heard "That's What It's All About," the current single from their upcoming Greatest Hits, Vol 2 which moves from 20-17* on Billboard's Country Singles chart, they knew it was a song about the things that truly matter. But when the 4-time Entertainers of the Year really took a close at the song and what it celebrates, they recognized it spoke pretty deeply about the price one pays to live their dreams. and decided that it made sense to film a video that showed the juxtaposition of how own earns their living and what lies closest to one's heart. "Whether you're jumping up onstage or going downtown to an office, driving a truck or working in a hospital, everybody has the thing they do that supports them and their family," says Kix Brooks of the low slung guitar and high-flying stage presence. "But at the end of all that, what it really comes down to is the people you come home to. the ones who love you and you love them. That IS what it's all about, and we got very lucky to see the visual aspect of this for us when we did." "We were watching some of the family footage on the side of the stage over the weekend," says Ronnie Dunn of the rafter-scraping vocals, "and a bunch of us were tearing up. I don't even know where they got some of this footage. There's stuff of my Dad, which really brings it home for me." Enlisting award-winning director Michael Solomon, the men hailed by USA Today for "the return of macho country" opened up not only their lives and their families to the process -- but invited their band members and crew to bring their families along, too. "We've got the greatest people in the world working for us," says Brooks. We want the families to know how much we appreciate 'em -- and we want the world to see how awesome all these folks are." Having filmed performance footage in Pittsburgh last night (Sunday, August 14), Brooks, Dunn, band, crew and extended family will set it up at Nashville's First Amendment Center where they will shoot a "portrait" of all the people who make it happen -- with the people who support the people who make it happen. 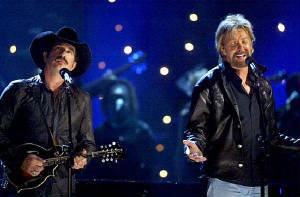 And, because it is Brooks & Dunn, they will perform for the assembled family, friends, neighbors and beyond. "We were really lucky to get this song, because it's about the thing that matters more than all of it: your family, your relationships, the people who love you. Strip it all away -- it's pretty powerful stuff, though you can get so caught up in all the stuff that comes with the rat race that you lose sight of that. For us, this video is not only a reminder. it's a way to let those people know how much their support means to us." 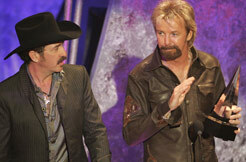 Brooks & Dunn were nominated today for Favorite Country Band, Duo or Group for the 32nd American Music Awards. Nominees for the 32nd annual “American Music Awards,” were disclosed today. The awards will be presented during a three-hour special on the ABC Television Network, Sunday, November 14, 2004, 8-11 PM (Eastern and Pacific Time). The special will emanate from the Shrine Auditorium in Los Angeles, California and be hosted by Jimmy Kimmel. 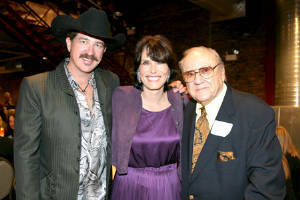 Kix & his wife Barbara were at the Monroe Harding Children's Home benefit Laughter for the Children, on November 18, 2004, where they were the honorary chairs. 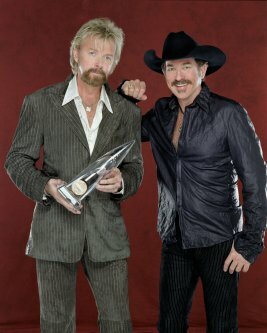 Congratulations to Brooks and Dunn on their AMA Duo/Group of the Year award! 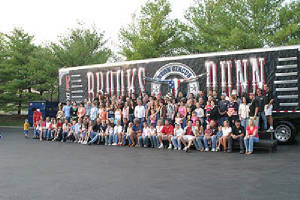 On October 17, IMC and the USO hosted a "Salute to the Military" with Brooks & Dunn." The event featured a buffet-style dinner reception prior to a concert by the legendary country duo at Nissan Pavilion. In attendance were active and reserve military personnel, including wounded servicemen and women from both Walter Reed Army Medical Center and Bethesda Naval Hospital. During the reception, Kix Brooks and Ronnie Dunn made a personal appearance and greeted each of the honored military guests, taking time to chat and have a photo taken with each soldier. Following the meet and greet with the soldiers, Robert Hytner presented Brooks and Dunn with a special award, on behalf of the USO, for their support of the military. The beautifully crafted award featured a large 9/11 memorial medallion in an elegant display case. Engraved on the front of the medallion were an American eagle, the U.S. flag, and an image of the Pentagon, accompanied by the inscription, "United in Memory. September 11, 2001." The reverse featured an engraving of saluting rescue workers standing atop the Pentagon above the unfurled flag which was placed on the building in the aftermath of the attack. Brooks & Dunn were visibly moved by the award and thanked IMC and the USO for having them at the reception. Later in the evening, the military guests and supporters were treated to orchestra-level seating in the Pavilion for the Brooks & Dunn concert. In addition to the Toby Keith and Brooks & Dunn concerts, IMC has donated thousands of tickets through the USO to members of the military and their families for events at Nissan Pavilion and the MCI Center in Washington, DC. During the month of September Nashville's Futurity benefiting the Ronald McDonald House and Vanderbilt Children's Hospital was a huge success. One special night put together by Kix and Barbara Brooks, featured the Dynamic Duo private performance along with Auctioneer Kix Brooks! The silent and live auction combined for a total of $130,355.00. Some of the highest bids were on Gibson Guitars, Superbowl and World Series tickets and Golf with Vince Gill & Kix. The highest item was $20,000 and included Breeding with Highbrow Cat, a very prestigious breeding horse. Brooks & Dunn tore it up onstage at the Republican National Convention last night - and are all over the prestigious New York Times this morning, who celebrate "Only In America" as "a brawny fistful of electric guitar chords and lyrics that pay tribute to a country where 'we all get a chance, everybody gets to dance...'." But for all the hub-bub and all that, the 4-time Entertainers of the Year were taken by the man who introduced the charity at the World of Hope benefit after the convention proper had wrapped up. "Bono was incredibly informed about the reality of healthcare around the world," says Ronnie Dunn. "It was impressive… and to hear him talk about Senator Frist, who he calls his hero and whom he's traveled with, just puts such a deep understanding on the Senator as a man whose humanity drives his politics. He couldn't have been nicer -- or warmer to us." Perhaps it's because Brooks & Dunn had a bit of ringer in the form of Brooks' 16-year old daughter. "He and Molly had a big ole time talking about art," explains the rocket-fueled guitarman Kix Brooks. "He draws, so she was telling him where he can get certain things -- and they got into a whole discussion about comic books, the online comic book movement. He was genuinely interested in her and her art and the whole world that art encompasses -- and to see him talk to my little girl as an equal, well, you can only imagine how that makes you feel as a father to see her relating artist-to-artist like that. 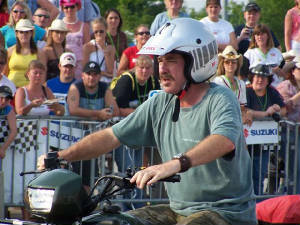 "As for the cavalcade of conventionism, Dunn was quick to say it was unlike anything they'd ever experienced. "It's pretty cool. They get you in these Secret Service lines -- and the cars just moooooove! You've got your clearance, you're in that lane, and you're gone. of it all, and humbled by it, too." "That's What It's All About" continues moving up the charts. A song celebrating the things that really matter, it's developing traction - and could quite possibly be a keynote song for 2008! At this years CMA Music Fest Kix participated in a Celebrity ATV Rodeo. Make sure not to miss Kix when Fisher's ATV World Show airs on The Men's Channel, 9-13-04 through 9-19-04. The times are as follows: Monday 10:30 P.M, Wednesday 11:00 P.M, Sunday 5:30 P.M. All times are EST. Check your local listings.